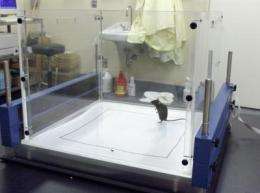 In an unfamiliar open arena, NKA mutant mice showed greater exploration, similar to the increased exploration exhibited by manic humans in an unfamiliar environment. Researchers at the University of Leeds investigating the genetic causes of bipolar disorder have identified two new drugs  one of which has already been found safe in clinical trials  that may be effective in treating the disorder. Bipolar disorder is characterised by mood swings between mania and depression. Like autism, it is thought to be a spectrum of disorders and, although its causes are not well understood, it seems to run in families and is thought to be caused by both genetic and environmental factors. Dr Steve Clapcote, of the Institute of Membrane and Systems Biology at the University of Leeds, who led the study, says: "We suspected from published studies of bipolar patients that levels of enzymes known as NKA or sodium pumps may be abnormal in bipolar disorder, but so far the evidence has not been convincing enough to warrant detailed clinical investigations." The research, published today in the US journal Proceedings of the National Academy of Sciences (PNAS), used a strain of genetically modified mice that exhibit symptoms very similar to humans in the manic phase of the disorder. The mice were bred with a particular mutation that prevents the NKA enzyme from functioning normally. When tested, the mice showed characteristics closely associated with bipolar disorder, such as increased tendency to take risks, hyperactivity, and disturbed sleep patterns. They also exhibited reduced mania when treated with anti-manic drugs. Current drugs available to treat bipolar disorders, although usually successful, are limited to either Lithium or Valproate. They can't be matched to specific types of bipolar disorder, and can sometimes cause unpleasant side effects. There is therefore a need for treatments which can be better targeted, and which are more effective and better tolerated by patients. The Leeds researchers found that the mice showed decreased activity of the NKA enzyme, as well as increased activity of a protein called ERK. Drugs known to have an effect on these two elements were administered to the mice, including Rostafuroxin and SL327, and both reduced their mania-like behaviour. "Rostafuroxin has been found to be safe in clinical trials for treating high blood pressure," explained Dr Clapcote. "No one has previously looked at this drug's effects on the brain, but our mouse studies show there's a possibility that it might also be suitable for people with mania. Similarly, SL327, which is known to inhibit ERK activity, was also found to reduce manic behaviour in the mice." "We think there is enough evidence now to start screening people with bipolar disorder to look for genetic mutations in the same NKA enzyme as that affected in our mice," says Dr Clapcote. "This will help us identify whether there is a group of bipolar patients that may be responsive to the novel treatments we have tested in the mice." He added, "We also want to do some further studies of these drugs on the mice, such as test different doses to see whether there are any side effects, and determine what biochemical changes occur in the drug-treated mice to find out how the drugs work. This will help us determine whether they might be suitable for people." Dr Tariq Mahmood, a consultant psychiatrist with Leeds Partnerships NHS Foundation Trust, who runs a bipolar disorders clinic, said: "Bipolar disorder is a serious condition that can affect one in 100 people. Like most psychiatric conditions, its biological basis is not well understood, which has hindered our efforts to develop diagnostic tests and specific treatments. This research is exciting and will, hopefully, lead to development of tests that will enable us to diagnose this condition early, and discovery of new drugs that are specific for individual bipolar patients." More information: "Mania-like behavior induced by genetic dysfunction of the neuron-specific Na+,K+- ATPase α3 sodium pump" is published in PNAS online Early Edition today. I have two relatives with comprooved bipolar disorder (mother and daughter). If we could help the research, please contact, or forward to the researcher.